As you may have noticed, we are undergoing a few changes here at FoodtoEat! Our new website is another step to help our mission of making online food ordering as easy as possible. In 2012 our CEO, Deepti Sharma Kapur, felt her stomach growling, went to get food and realized how long the line was at her favorite food truck. They say it only takes one spark to start a fire (or in this case, a growl to start a roar) and Deepti took advantage of this hunger and started something great. As we embark on a new chapter in our business, we want to bring it all back to where it began and what we continue to strive for. FoodtoEat, at its very core, is about social responsibility. We want our vendors to thrive in a business that can be dangerously competitive. 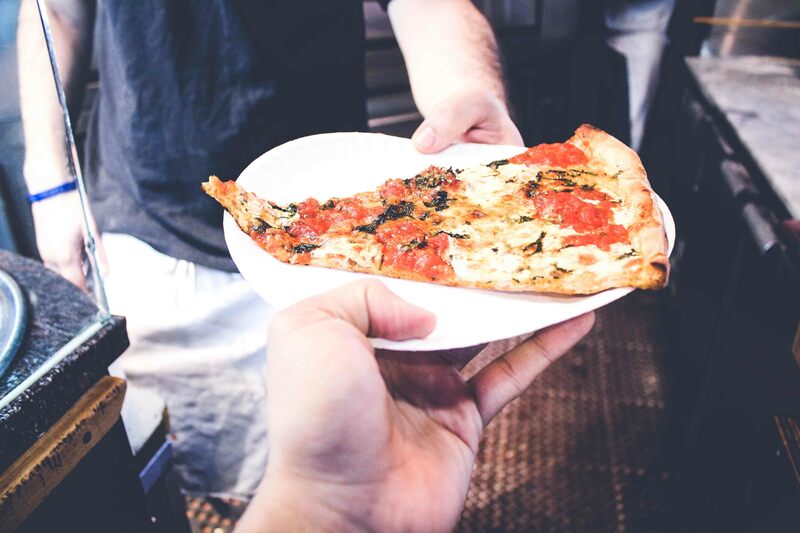 Our mission is to help local restaurants, food trucks and caterers get more business by putting their products online and ready to order at the tips of your fingers. While our competitors are charging 15-18% per order, we only charge 10 cents – you can order knowing you’re putting money back into the vendors’ pockets. New York City is a bit of a food mecca; keeping the food culture alive is important and taking large amounts of money from hardworking vendors is not a way to do that. Not only do we give our vendors an easy online ordering platform, we also provide them with corporate catering connections. By signing up with FoodtoEat, vendors and clients have the chance to be a part of our growing concierge catering service. Unlike your typical online food ordering service, we help our vendors flourish by exposing their food to offices around the city. We also help our clients by bringing incredible food to their offices. Whether it’s an ice cream bar, build your own burger or a food truck directly to your office, we’re always finding ways to help our vendors cater to our awesome clients like Tumblr and Hulu. Ordering with friends made easy on our new website. Because of our connections and low fees, we are able to make online ordering not just easier on the vendor, but for the customer. This month, we launched our brand new website that features social ordering. Split the bill at the press of a button! How many times have you wanted to order food with a friend and splitting the bill is an absolute disaster? We’ve solved that. You can invite your friends into an order from different computers and you can buy delicious food together. 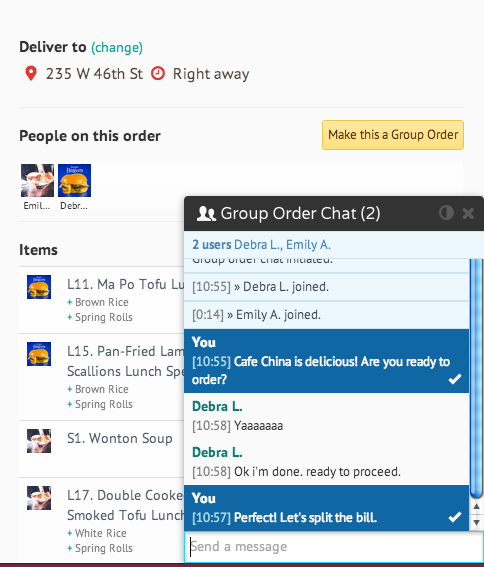 Our new chat feature lets you interact with people while you’re ordering together. 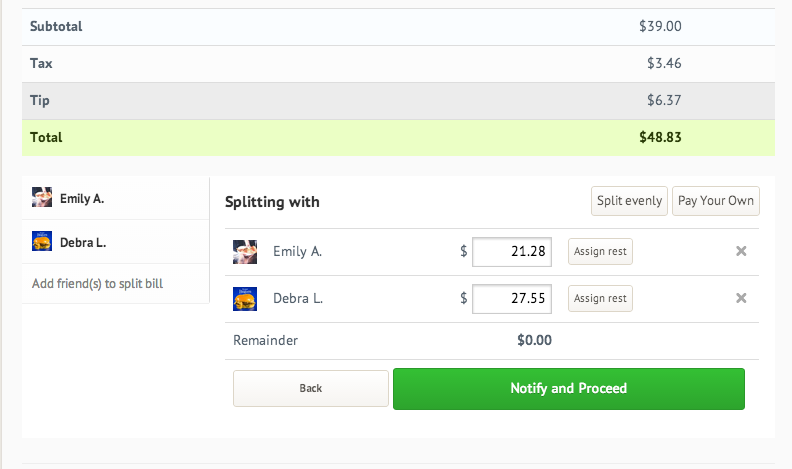 At the end of the order, all you need to do is click a “split bill” button and voilà! You no longer need to walk to Duane Reade and buy a pack of gum to break your $20. You can order from your office computer with co-workers or on your iPad in your dorm, it’s just as simple as the click of a button. At the end of the day, we want to make online food ordering the best it can be. Help us feed you by ordering today. For the launch of our new website and social ordering feature, we are running a promotion. Invite your friends, family, co-workers, dogs, anyone to order with you and you can receive 20% off the entire order! Join the party! Make a social group order with your friends and receive 20% off the entire order.